Nick Cave’s latest venture to the screen is a breathtaking one, though not for those after a polite introduction, Getintothis’ Patrick Clarke reflects on a labyrinthine triumph. 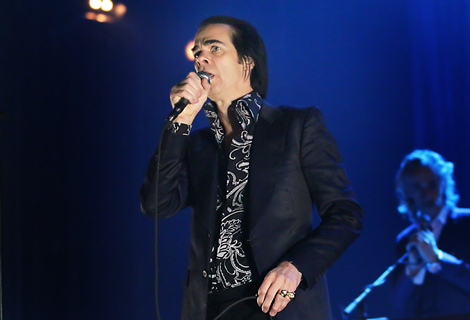 “Songwriting is about counterpoint,” says Nick Cave in 20,000 Days on Earth, “putting two disparate images against each other and seeing which way the sparks fly”. The same can be said of film-making for Ian Forsyth and Jane Pollard, the artists-turned-directors at the helm of the project, for this is a music doc like no other, an artful juxtaposition of fiction and reality lent clout by directional flair and of course the venerable charisma of Mr. Cave himself. It’s an unusual film, on the one hand an intimate look behind the scenes of Push the Sky Away, The Bad Seeds‘ 15th album, and on the other a post-modern narrative in which Cave is most certainly playing a part – it just so happens that part is of himself. The ‘plot’ follows that titular 20,000th day in the life, and initially revolves around central conversations with the vocalist, at first speaking to a therapist on his childhood, early sexuality and his relationship with his father, who died when Cave was 19. The segment is a remarkable one, if only for its frankness, cutting through the enigmatic character studies of his songwriting far more than any straight-up interview; indeed in a live Q&A/performance from The Barbican after the film he is jarringly terse in conversation with Edith Bowman, the musician shifting edgily between the couch and piano, guarded to unravel the intricacies of the film and evasive in the face of a bombardment of compliments. It’s a similar affair as Cave visits an archivist for a delve through the documents of his career, and it’s the singer’s wistful reminiscences, lavishly shot in oceanic colour that see the movie as a beguiling biography. Brimming with deadpan charisma he savours his accounts of his myriad muses, years of junkie wilderness and visceral early gigs as The Birthday Party, reaffirming his prodigious penchant for a yarn well spun. It’s between these conversations, themselves divided and laid sporadically through the first two thirds, that the viewer’s loyalty to the musician are tested; lengthy studio sequences thin on anecdote are given acres of space and Cave remains entirely self-possessed. Strangest of all is the first of a series of car-ride sequences, where Cave is joined by a hallucination of Ray Winstone for an improvised conversation on the self-construction of personal mythology. The chat, and a similar sequence later with Kylie Minogue, bring Cave‘s subtleties out of their shell, a joyous opportunity for character study and rife with spellbinding chemistry. This is not ‘the story of Nick Cave‘ and fairweather or prospective fans won’t gauge much in the way of digestible biography, yet the film’s self-indulgences remain balanced for the most part, sublime direction doing much to lend approachability. It’s at the conclusion however that it shines irregardless of perspective, boasting a monstrous and fiery live rendition of Jubilee Street that clashes with flashing stabs of archive gig footage. Suddenly the rich, capacious melancholy of the film dovetails into cacophony, Cave saturated with the passion of performance, and everything shifts toward emotional outpour of terrific intensity. The film is an indisputable success, imbued with the same mesmeric magnetism of Cave‘s literature and music, but again like his prior work fits best as another expansion to his vibrant legacy, rather than a simple introduction. That said there’s no disguising the fact that at heart it is simply a fantastically made film, if not hugely accesible, and one it would be reprehensible for any music fan, regardless of leanings, to miss.